Is amalgam filling white color? Are mercury tooth fillings really safe or not? Today, the dental industry has a varied number of options for fillings, one of which is the dental amalgam. Prior to deciding whether or not this filling option is right for you, you should ask your dentist questions such as: what is dental amalgam, and is dental amalgam safe, toxic, dangerous? By doing your own research or allowing your dentist to answer these questions for you, you will be better able to decide whether you should get amalgam fillings or not. For more than one hundred and fifty years, dental amalgam has been used by many dentists as a material to fill cavities that have developed as a result of tooth decay. 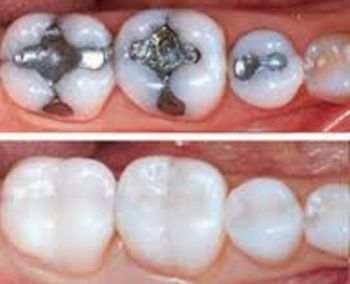 Dental amalgam is a mixture of copper, tin, liquid mercury, and powdered alloy comprised of silver. Because of its silver-like look, amalgam fillings are often times referred to as ‘silver fillings.’ There fillings are not permanent, you can replace theme with tooth-color composit fillings. Amalgam filling dangers, side effects. Is this filling safe? This is probably the most popular question asked by persons interested in getting this type of dental filling. The reason for this is that dental amalgam contains levels of elemental mercury, which can have harmful effects on the kidneys and brain. The United States FDA (Food and Drug Administration) has done various scientific reviews, in order to determine if dental amalgam is indeed unhealthy for patients. Reviews conducted by the FDA have shown that low levels of vaporized mercury are associated with this dental filling; however, the levels of mercury found in persons with amalgam fillings are well below the levels that would result in adverse side effects. Based on these findings, the FDA has deemed dental amalgam safe for adults and children six years old and older. There has been limited information associated with the potential side effects of this type of dental filling in children under six years and pregnant women. As such, it is not recommended that these individuals get amalgam fillings. Additionally, there has been no evidence that dental amalgam fillings are toxic, as the components of these fillings are properly mixed by professionals before use, and therefore are not poisonous. No disease or illness has been associated with patients that use dental amalgam fillings, and top reviews conducted by the U.S. Public Health Service, National Institutes of Health, and the FDA have determined amalgam fillings to be safe. As such, determining if you should get dental amalgam is one hundred percent a matter of personal preference.